What Is Israel's Iron Dome? Israel got itself into a little mini-war in Gaza, and Hamas is firing off an extra dose of rockets into the Holy Land. What's (maybe) stopping them? Something called the "Iron Dome"—and what exactly is an Iron Dome? There's no one "Iron Dome," but rather a modular system of interceptor rocket batteries that are deployed sort of how you might build cell phone antennas. There are currently only five, strategically-placed batteries, but the more Israel builds, the better the Iron Dome 'coverage' is across the nation. Israel says each Iron Dome battery can protect a roughly 60 square-mile radius. Each Iron Dome battery consists of three separate parts that work together: radar to track the rockets as soon as they're heading across the Israeli border, software that predicts each rocket's exact trajectory, and Tamir interceptor missiles fired from the ground within Israel that collide with the rocket and blow it out of the sky. Iron Dome is designed to cherry pick rockets that are destined for residential areas, ignoring warheads that will probably just land in a barren field. Since Hamas uses cheap, unsophisticated rockets that lack any kind of guidance system—and uses a lot of them—this function is important, and should keep Iron Dome from wasting its time (and ammo). Each interceptor rocket can cost up to $90,000 a pop. And sometimes it takes more than one Israeli rocket to stop a rocket attack. This adds up—the IDF says Iron Dome has intercepted 307 rockets in the past 5 days alone. 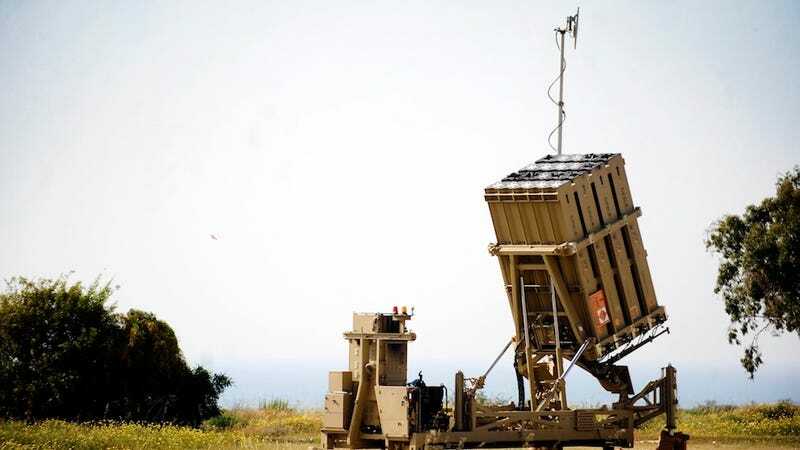 This is, of course, on top of the system's total price tag; Israel says it'll invest $1 billion on expanding Iron Dome, and the US is chipping in over $200 million to help out. Missile defense is a notoriously murky, notoriously tricky branch of defense technology. A lot of money (and hot air) has been expended trying to hype up systems that just plain do not work, as was the case with America's "Star Wars" missile defense plans in the 1980s. Inflated success rates have been an issue for proponents of Patriot missile systems in the US, too. If you ask Israel, Iron Dome is knocking down nearly 90% of the rockets Hamas flings at it—which is majorly impressive, if accurate. But it could be inaccurate. Asking a defense mouthpiece how well it's doing its job of defending in the middle of a war isn't a good way to get the truth. Once the dust has settled a bit, we might get numbers that aren't propagandized.